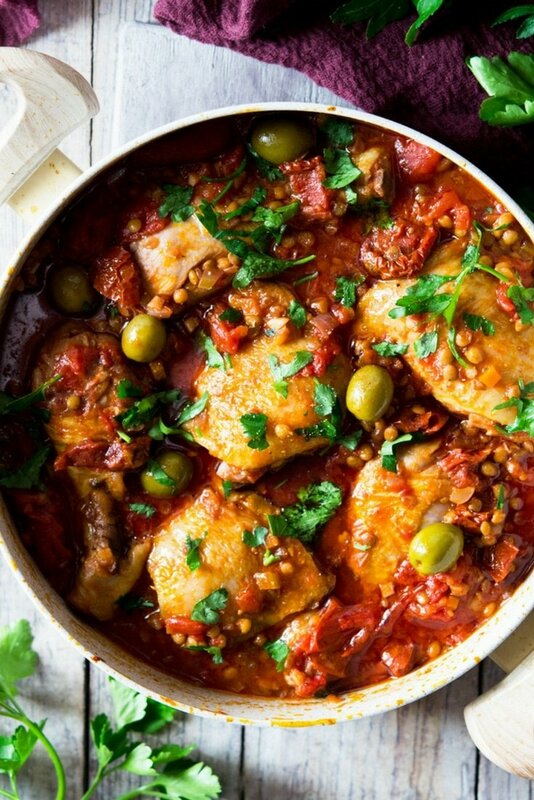 Succulent, fall off the bone braised chicken with olives, tomatoes and lentils. This chicken recipe is so easy to put together and makes a healthy, flavour packed meal the whole family will enjoy any day of the week. Made with chicken thighs, green olives, sun-dried tomatoes and lentils. Because there’s nothing easier than a one-pot meal! I’ve made this braised chicken with olives at least 3 times in the last two weeks and I love it. It’s is the type of dish that you can leave to simmer away while you get on with other things. It’s full of delicious, Mediterranean flavours and the addition of lentils make it a hearty and substantial meal that’s so good for you. Tip: I use a mixture of chicken thighs and drumsticks with the skin on because I think it gives a lot of extra flavour to the dish and it’s also a little cheaper to buy. Because the chicken is braised in a tomato sauce the skin isn’t crispy or very nice to eat when it’s ready. I simply remove it at the end and I don’t mind doing this but you could also buy skinless chicken for this instead. It’s made with a soffritto base (finely chopped carrot, celery and onion) and red wine. 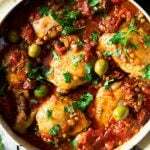 It’s important to let the soffritto saute slowly until soft, it’s really the only work that’s involved to make this chicken with olives, tomatoes and lentils and gives a lot of depth and flavour to the sauce. Tip: Use a red wine that you would drink and stay away from cooking wine it’s just not nice and wouldn’t give the same flavour to this chicken dish. First, heat a little olive oil in a saucepan and brown the chicken on all sides, remove it from the pan then set aside on a plate. Add the finely chopped soffritto (carrot, celery & onion) and saute Finely chop the carrot, celery & onion and saute for 5 minutes then add the garlic and saute for another 2-3 minutes until soft. Add the chicken back to the pan and add the red wine. Reduce the wine by half then add the canned plum tomatoes (photos 3-5). Use the side of a wooden spoon or spatula to carefully mash the plum tomatoes into smaller pieces. Add the olives and chopped sun-dried tomatoes (photos 6 & 7). Simmer the chicken, olives and tomatoes for 40 minutes then add the pre-cooked lentils. Stir them in and simmer again for another 10 minutes. Serve with a sprinkling of parsley. The best thing about this one-pot chicken with olives is that it makes GREAT leftovers. I eat this cold the next day for lunch and it is so good. The flavours get time to develop overnight and get extra delicious so it’s worth keeping some if you can. 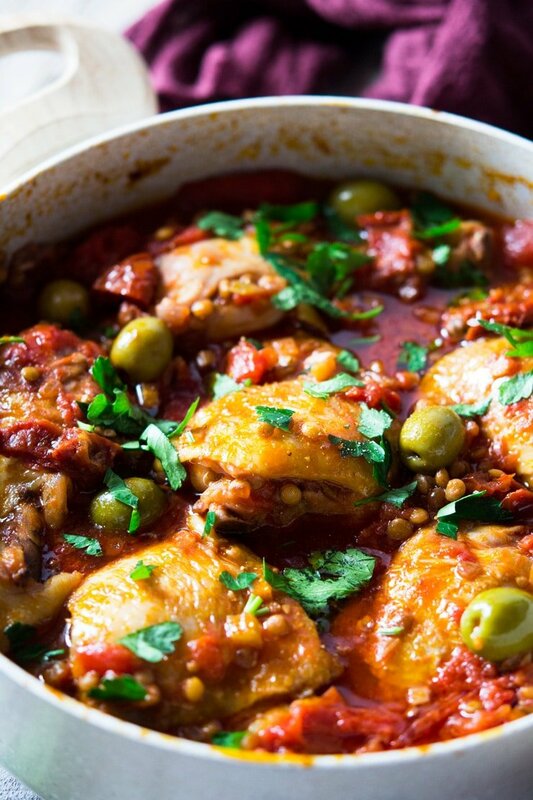 If you’ve tried this one-pot chicken with olives, tomatoes and lentils or any other recipe on the blog then don’t forget to rate the recipe and let me know how you got on in the comments below, I love hearing from you! You can also FOLLOW ME on FACEBOOK, TWITTER, INSTAGRAM and PINTEREST to see more delicious food and what I’m getting up to. First, heat the olive oil in a large saucepan and brown the chicken on all sides, remove it from the pan and set aside on a plate. Finely chop the carrot, celery & onion and saute in the same pan for 5 minutes then add the garlic and saute for another 2-3 minutes until soft. Add the chicken back to the pan and add the red wine. Reduce the wine by half then add the canned plum tomatoes. Use the side of a wooden spoon or spatula to carefully mash the plum tomatoes into smaller pieces. Add the olives and chopped sun-dried tomatoes and a good pinch of salt and pepper. Simmer the chicken, olives and tomatoes uncovered for 40 minutes then add the pre-cooked lentils. Stir them in and simmer again for another 10 minutes. Serve with a sprinkling of parsley. Tip: I use a mixture of chicken thighs and drumsticks with the skin on because I think it gives a lot of extra flavour to the dish and it's also a little cheaper to buy. Because the chicken is braised in a tomato sauce the skin isn't crispy or very nice to eat when it's ready. I simply remove it at the end and I don't mind doing this but you could also buy skinless chicken for this instead. Tip: The soffritto (finely chopped carrot, celery and onion) needs to be sauteed slowly until soft, it's really the only work that's involved to make this dish and gives a lot of depth and flavour to the sauce. Don't try to rush this step. Tip: Use a red wine that you would drink and stay away from cooking wine it's just not nice and wouldn't give the same flavour to this chicken dish. Thanks so much Olga, hope you enjoy it! This was delicious – thank you! It’s definitely going to be something that I make often. Just curious: any reason not to use uncooked lentils and just throw them when the soup starts cooking (maybe with a little extra liquid)? Hi Abby, thanks so much I’m so happy you enjoyed it! You could definitely use uncooked lentils and add more liquid, probably to cover them then top up as needed. The only reason I used canned was for quickness. Most dried lentils need to be soaked for a few hours first so it was just to speed things up. Thank you! This looks deliciously filling and satisfying! I love the chicken parts used (with the skin), definitely brings out more taste and the mix of flavors. A real meal in a pot! I made this for dinner last night.. It came out so well, it was so delicious..
Hey Tamara, thanks so much for letting me know I’m so happy you enjoyed it! I love the gorgeous colors in this “stew.” I am definitely going to have to give this a try! Thanks so much Marlee, hope you enjoy it! Mmm! That’s Sunday dinner sorted! Can’t wait to try this..hungry just looking at the photo!! That looks like a delicious and fancy way to use less expensive cuts of chicken. I have to try this recipe! It’s so easy too, thanks so much Scarlet! Oh my gosh, so many of my favorite things all in one dish! Love the colors, love the textures, love the flavors. Thanks for sharing…I’m pinning this for sure! You got me with the olives. I LOVE olives! 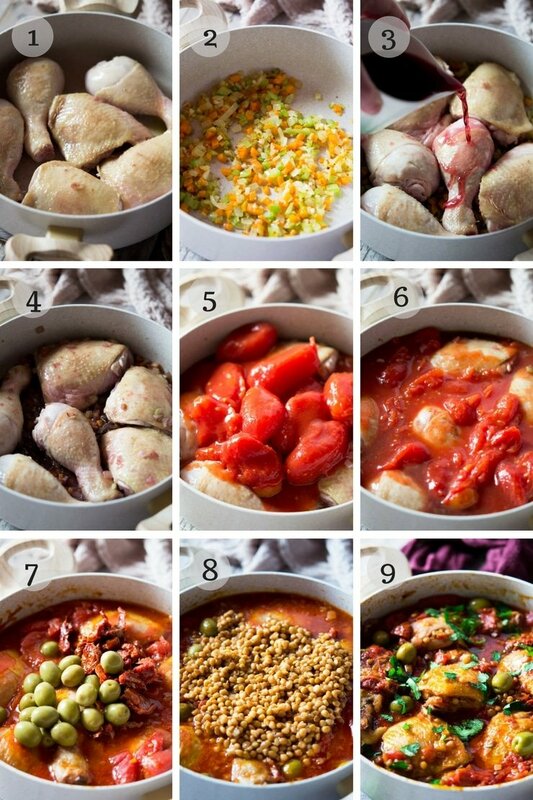 More, I love one pot meals. Perfect for weeknight. I love olives too, so good with chicken! I love this olive touch on this chicken dish! It makes look so pretty and YUMMY!! Thanks Jamie, one-pot meals are great! How can one say no to a dish packed with Mediterranean flavors, right? It looks amazing and I also love your step-by-step photos! Thank you Julia, glad you found them helpful!